One of the simplest training tools for practicing strikes in Renaissance martial arts was the pell. 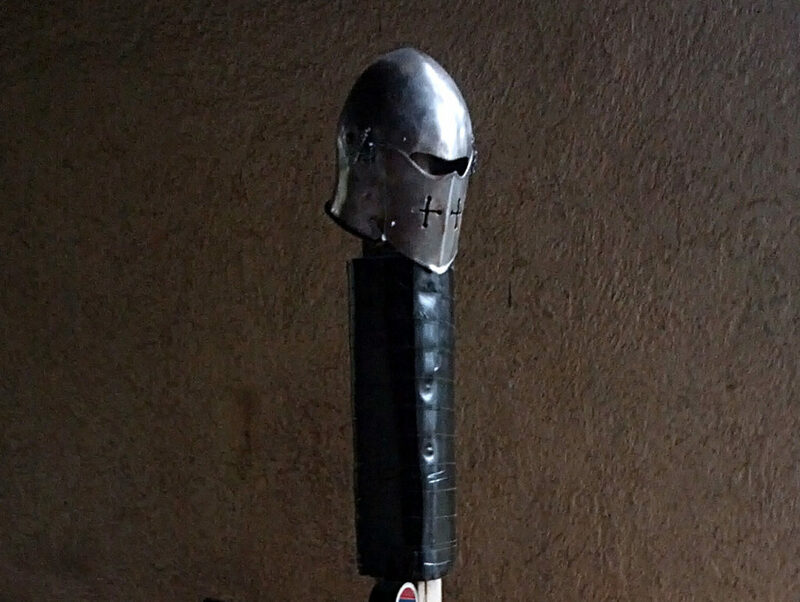 The pell was an ancient training device for practicing swordplay and training soldiers in arms. It typically served as a practice target for striking with a shield and a wooden sword. A pell is something like the Medieval equivalent of a boxer’s punching bag. 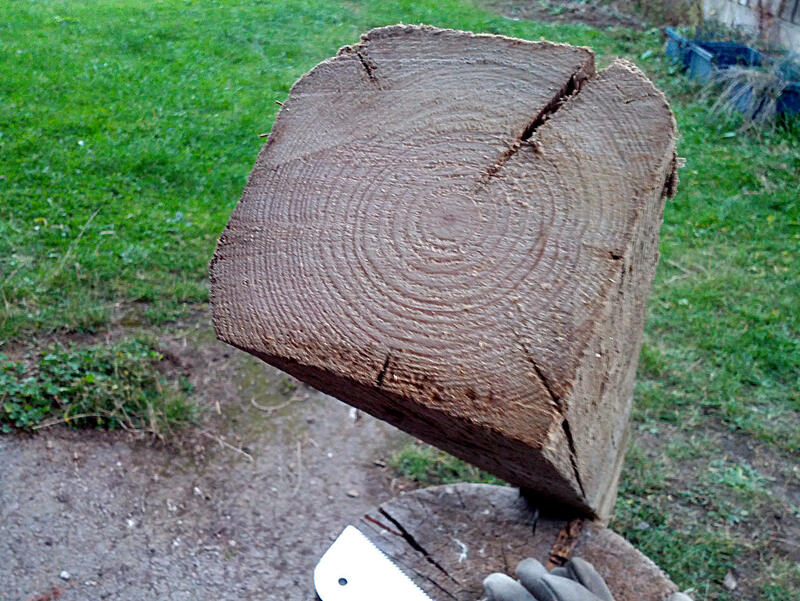 It consists of an ordinary wooden post or tree trunk planted firmly in the ground. A pell might be man-height and roughly six to twelve inches in diameter. This article got me started with pell works. 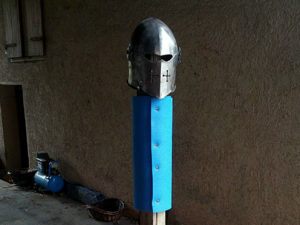 While a pell does not replace a proper sparring partner some techniques can be trained on a pell. More on this topic can be read on Essential Training: The Pell by Stewart Feil. 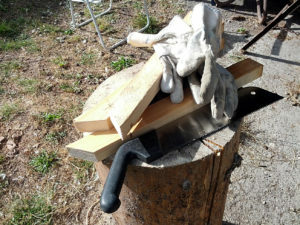 I’ve a lot of material around and decided to make some use of old wooden beams that fell pray to woodworms and weather. The beams are roughly 9.5 cm per side and can not be used for supporting constructions any more. First a beam was selected and reduced with a pit saw to almost human size without further measurement. The remains were simply split in two for supports and supplemented with two more pieces of the same beam type. Now I needed some struts for the supports. For that I used roof battens that remained from the new roof for our shed last year. I simply bevelled one side with the pit saw. Still no dimensions since I just used my eye and my thumb, sorry. This is how everything looks slapped together. 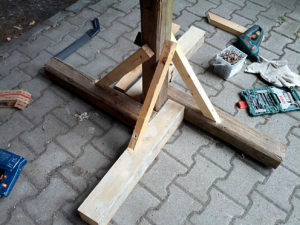 I used at least two 180cm long sunk screws for the beams and some smaller ones for the struts resulting in a pretty stable base. The pell is really heavy now but can still be moved around by a single person. Next is the camping mat. An old rug may be used as well but I didn’t have that around. The helmet was just put on top of the pell to get the correct positions for the desired hitbox. It can be removed any time. I used washers with the screws this time to not damage the mat (for now). Finally it’s time for tape. This will help a lot to improve the lifetime of the camping mat. Use a lot of this! The mat and tape will reduce noise and stress on blade and wrist a lot. Once the mat is due it can be replaced without the need to prepare another beam. I intented to use a wooden waster on the pell but this turned out to be a real killer for the mat. Especially when stabbed. Not so with the blunt steel sword. While the blade may still rip through the mat everything will be kept nicely in place by the tape.